Be My Valentine 6 Pack: Includes your choice of 6 1.44oz Golden Spiral Heart-Shaped bars. Arrives in an eco friendly brown box for your pleasure. 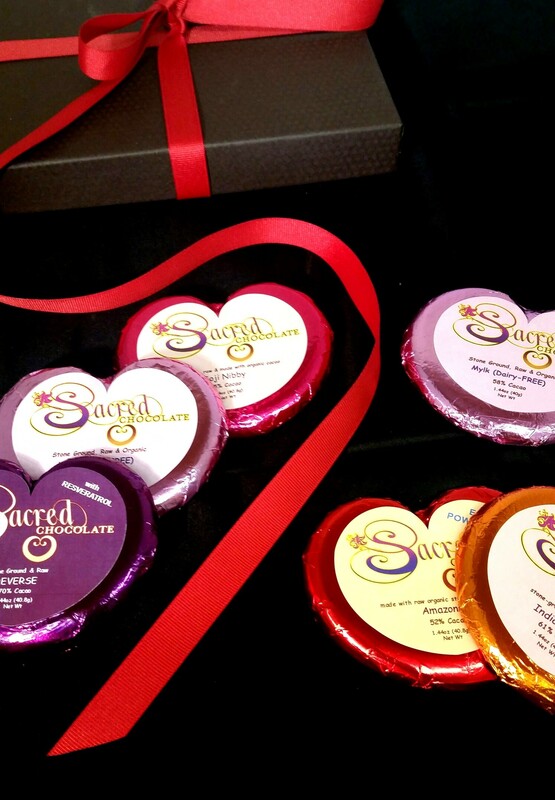 Sacred Chocolate Sweetheart Gift Boxes are the perfect gift! Enjoy the smiles and laughter as your loved ones, partners, friends and family open their hearts to the Sacred Chocolate magic. REMEMBER TO MAKE YOUR SELECTIONS BELOW USING THE DROP DOWN MENUS. IF NO SELECTIONS ARE MADE YOU WILL RECEIVE THE DEFAULT SELECTIONS. ALSO THE GIFT NOTE MUST BE PLACED IN THE BOX ON THIS PAGE! REMEMBER TO MAKE YOUR SELECTIONS ABOVE USING THE DROP DOWN MENUS. IF NO SELECTIONS ARE MADE YOU WILL RECEIVE THE DEFAULT SELECTIONS. ALSO THE GIFT NOTE MUST BE PLACED IN THE BOX ON THIS PAGE! Be My Valentine 6 Pack: Includes your choice of 6 1.44oz Golden Spiral Heart Shaped bars. Arrives in an eco friendly brown box for your pleasure. Selection Instructions: Choose 6 Sacred Hearts in the flavor combinations of your preference from the following lists. Use the drop down menus to add your selections to your gift box. Once added you can see your selections in your cart to verify. Personalized Note: To add a personalized gift card please write your note in the box as indicated. The box is small and allows you to type one sentence or more. You can scroll with the arrow keys to check you are happy with your note, which you can also review and change in your shopping cart.